It’s time for a new sketch at Freshly Made Sketches. Our sketch designer this week is my super talented NZ friend Karren Johnson. Karren’s so creative with her card making and is an amazing colourist! I really love her sketch! I don’t have any large dies that gave me that great curve, so I hand cut my cardstock as close to the sketch as I could. The flowers, I watercoloured with my watercolour pencils, are from Birthday Blooms. These flowers have quite a lot of smaller flowers and leaves around them, but for something different, I cut them all off. I then coloured the largest of the leaves and tucked them back under the flowers. The black leaves are cut with Flourish Thinlit Dies and the sentiment I’ve used is from Stampin’ Up! Blooms and Wishes. Initially I had an all white background but felt it looked a bit plain, so I picked up a discarded piece of designer series papers I had on my desk and added it to my card. This great chevron paper is from a retired pack called Pop of Pink Specialty Designer Series Paper. 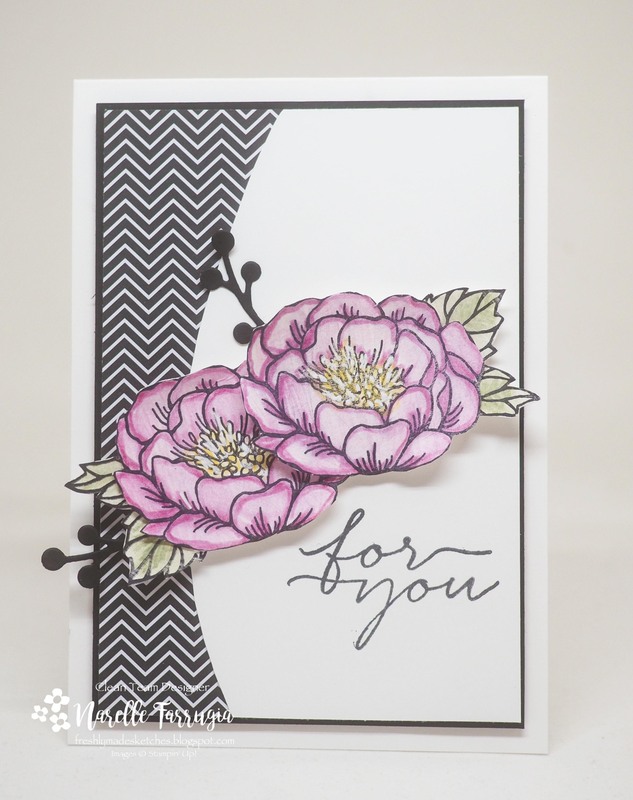 I really liked the contrast of the black chevron, Rich Razzleberry flowers and white cardstock. We would love it if you could join us with this sketch challenge. 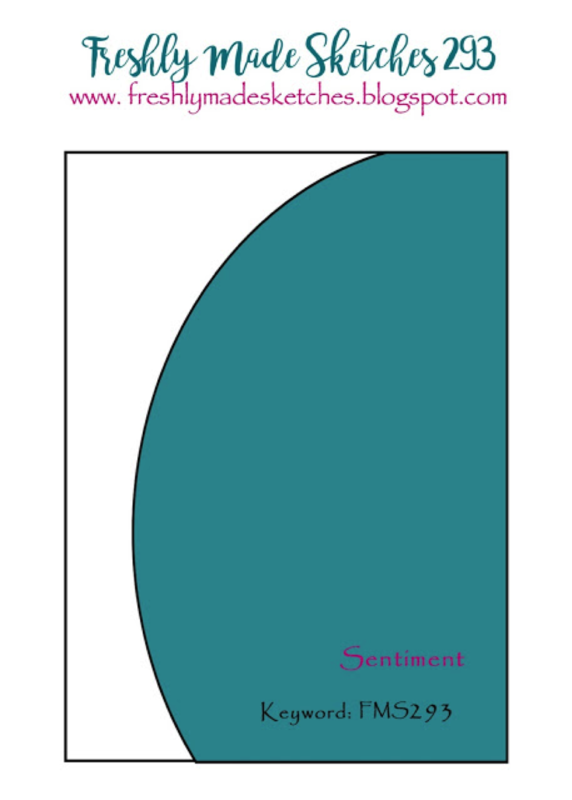 Head over to Freshly Made Sketches and link up a card. While you’re there, take a look at the fabulous inspiration from the design team. Oh Narelle! This card is gorgeous! Those flowers are so pretty and your colouring is amazing! I love it! You and that fussy cutting! You are the queen! Your hand-cutting is amazing! (Love Amy’s comment by the way about the fussy-cutting Olympics!) Beautiful card, gorgeous patterns and flowers. I love the chevron paper as an accent to your gorgeous flowers! And yes your fussy cutting is fabulous! Lovely card! Your rich colorful florals (beautifully tinted by the way) are perfect with the monochromatic backdrop. You always make nice cards!